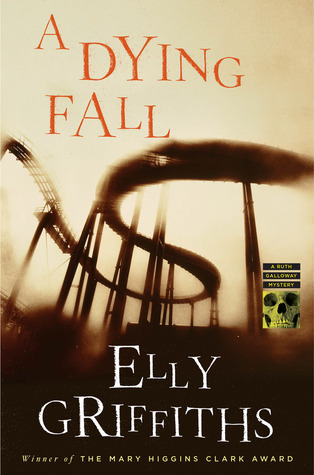 After a day of yard work I sat on the porch in the sun, drinking a glass…hmmm some glasses of Jersey Blush, the last in the group of three wines that I bought Jersey Red, Jersey White and Jersey Blush and finished my latest book from Elly Griffiths, A Dying Fall. I was little concerned because Ruth leaves the familiar setting of Norfolk, where the other books were set. Ms. Griffiths developed such a sense of place in the first books that the setting was almost another character in the series. My fears were unfounded. The setting is not as moody and does not evoke the sense of isolation of the earlier books, nonetheless this book was another good episode in Ruth Galloway and crew’s story. The complicated relationship between Ruth, Cathbad and Nelson is expanded upon in a realistic manner leaving you not knowing what to hope for between them all. The best part about it though, for me, was that the story line involved King Arthur and that has always been a favorite of mine. I read The Once and Future King and I think I have seen just about every TV serial/movie/History Channel discussion about Arthur, Camelot and the attending legends and history. Elly Griffiths’ exploration blends legend, fact, and an original twist for a satisfying take on King Arthur. The mystery is well crafted and I didn’t figure out the culprit until revealed. There are red herrings and twists and turns in the plot that keep you guessing the whole way. If you enjoy mysteries of the “soft boiled” variety, I highly recommend this series. The tally is four stars for the book and the wine was good, too. This entry was posted in Book Reviews and tagged review, wine.